On the West of India, between the Gulfs of Kaehh and Cambay, the ancient and once famous country of Kathiawad projecting into the Arabian Sea. The land of Kathiawad was holy and was known as the place flowing milk and honey, towards which merchants from Arabia, Turkey, Northern Africa and South-Eastem Europe directed their ships and acquired the wealth to be obtained from trade with the Indies. Elections brings out strange things ~ one such witnessed and in news in Gujarat. Politicians visit Temple seeking blessings from the Lord, trying to garner sympathy and votes. A very famous temple, (the present one is rebuilt after being pillaged many a times by invaders) ~ the one seen now has been built in the Chalukya style reflects the skill of the Sompura Salats, one of Gujarat's master masons. The temple's śikhara, or main spire, is 15 metres in height, and it has an 8.2-metre tall flag pole at the top. The temple is situated at such a place that there is no land in a straight line between Somnath seashore until Antarctica. 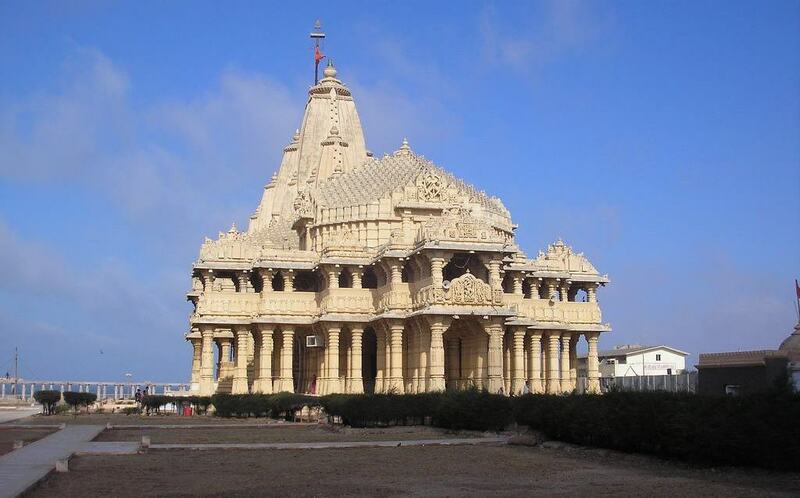 It is to this temple at Somnath visited - Rahul Gandhi registered as a "non-Hindu" visitor as headlined in many a media. The apparent "slip" ignited a storm on Twitter with 'Somnath Temple' emerging as one of the top trends of the day. An array of Congress leaders put out emphatic denials and accused the ruling BJP of circulating a "fake entry" to discredit their boss-designate. "We have no qualms in saying that Rahul Gandhi is a Hindu. Not only is Rahul Gandhiji a Hindu, he is a 'janeu dhari' (Brahmin) Hindu. BJP should not bring down the political discourse to this level," Congress spokesperson Randeep Surjewala lashed out. Those who know a little bit of history would know the family tree of Rahul and how it gets linked to Brahmin !! - At the start of a two-day campaign in the crucial Saurashtra region, the Congress vice president visited the renowned temple along with Ahmed Patel and others. A media coordinator, Manoj Tyagi, reportedly signed in for the whole group in a register meant for non-Hindus, who need special permission to visit the temple. No useful purpose would be served in reading more on that – so here is something on Somnath temple, taken from various sources. Shree Somnath is first among the twelve Aadi Jyotirlings of India. Ancient Indian traditions maintain a close relationship of Somnath with release of Chandra (Moon God)from the curse of his father-in-law Daksha Prajapati. With the advice of Prajapita Brahma, Moon arrived at the Prabhas Teerth and worshipped Bhagvan Shiva. Pleased with the great penance and devotion of Moon, Bhagvan Shiva blessed him and relieved him from the curse of darkness. Pauranic traditions maintain that Moon had built a golden temple. A magnificent temple stood there and millions had worshipped at this holy place, which was savaged and brutally destroyed again and again by Islamic invaders. Though plundered by invaders, the Temple was rebuilt every time with the reconstructive spirit of the people. The modern temple was reconstructed with the resolve of Sardar Patel who visited the ruins of Somnath temple on November 13 1947. Then President of India, Dr. Rajendra Prasad, did the Pran-Pratistha at the existing temple on 11 May 1951. In 725 CE, Al-Junayd, the Arab governor of Sindh is said to have destroyed the second temple as part of his invasions of Gujarat and Rajasthan. The Gurjara-Pratihara king Nagabhata II is said to have constructed the third temple in 815 CE, a large structure of red sandstone. In 1024, during the reign of Bhima I, the prominent Turkic ruler Mahmud of Ghazni raided Gujarat, plundering the Somnath temple and breaking its jyotirlinga. By some accounts in 1783, Maratha king Mahadaji Shinde, victoriously brought back three silver gates from Lahore after defeating Mahmud Shah Abdati, to Somnath. They were however to be placed in the temples of Ujjain. In 1842, Edward Law, 1st Earl of Ellenborough issued his the Proclamation of the Gates, in which he ordered the British army in Afghanistan to return via Ghazni and bring back to India the sandalwood gates from the tomb of Mahmud of Ghazni in Ghazni, Afghanistan. 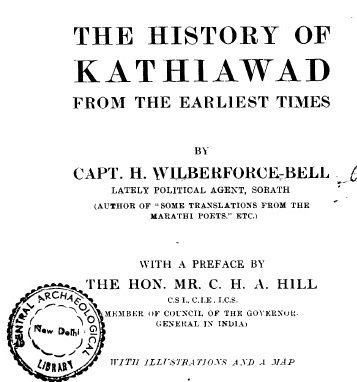 Here is something excerpted from a history book ‘the history of Kathiawad’ by Capt. H WilberforceBell, a century ago. In A.D. 1025 took place one of the most stirring events in the whole history of Kathiawad, for Mahmud of Ghazni attacked and completely destroyed the temple of Somnath at Prabhas Patau, and in so doing created one of the great landmarks of Indian history. Of the wonderful Temple of the Moon we are so fortunate as to possess such records that to make a mental construction of the same or to understand the grandeur and greatness attached to it we are not obliged to draw extensively on the imagination. We have been left, indeed, the account of an eye-witness, for the great Arab commentator, Al Biruni, visited Somnath when in India and placed on record all he saw with much exactitude of detail. Al Biruni was born near Khiva in a.d. 973, and died about 1031. He made several tours in India. Ibn Asir, another Musalman historian, relates that whenever there was an eclipse a hundred thousand Hindus assembled at the Somnath temple for worship, and the shrine was endowed with the produce and revenue of more than ten thousand villages. In the temple, he says, were jewels of most excellent quality and incalculable value. One thousand Brahmans attended daily worship, and a band of three hundred and fifty sang and danced at the gate of the temple, each one of whom received a daily allowance. Such was the place Mahmud of Ghazni was fired with the desire to loot, and doubtless he was actuated by the zeal of religious fanaticism. Though there is some discrepancy in dates, most probable year of departure of Ghazni was A.D. 1024. Mahmud of Ghazni's was only the first of a series of expeditions against Somnath, for no less than five times subsequently — namely in a.d. 1297, 1318, 1395, 1511, and 1520 — did Mahomedan leaders take their men to attack it. The beautiful relic of Hindu architectural art now at Prabhas Patan is doubtless that which was built by Bhimadeo of Anhilwad Patan, and has withstood these five incursions and the ravages of time. To attempt to describe it is wellnigh impossible. It is very massive and imposing, and its inner shrine is octagonal in shape. The stones of which it is composed are cut with great regard being paid to symmetry, and the carving in relief on the exposed sides leaves nothing to be desired from an artistic point of view. The whole building reflects the best period of Indian architecture and is quite worthy of the famous Siddha Raj Jaisinha of Anhilwad, who is reputed to have undertaken the adorning of Bhimadeo's building. The gates of the original Somnath temple, which were taken away to Ghazni, have never been traced, and they are traditionally supposed to have found a resting-place elsewhere. The arrival of Colonel Walker with the Gaekwad's army in a.d. 1807 to conclude a settlement regarding the tribute to be paid, the happenings in Kathiawad were of minor importance. In a.d. 1804 Rana Sultanji of Porbandar was deposed by his son Haloji, and had friendship with Nawab of Junagadh, who hadin the same year mortgaged Kutiana to Raghunathji and thus declared his friendship with the family which had done so much for him. Colonel Walker's arrival opened up a new epoch in the annals of Saurashtra, and the year A.D. 1807 was the beginning of an era of peace such as the peninsula had not experienced since Mahmud of Ghazni made his incursion to obtain possession of the treasure of Somnath temple nearly eight hundred years before. The Viceroy and Governor-General of India, Lord Curzon of Kedleston, P.C, G.M.S.I., G.C.I.E., C.B., visited Kathiawad in November a.d. 1900. Landing at Verawal, he was an interested visitor to the temple of Somnath, and afterwards proceeded to Junagadh, where he opened the Arts College and Technical Institution. Whether he signed the register at Somnath would be an out of portion Q .. .. !! Amazing history of the Kathiawad. I like reading about history articles. I hava your blog on my bookmark meaning i am tuned in to see more of what you post.